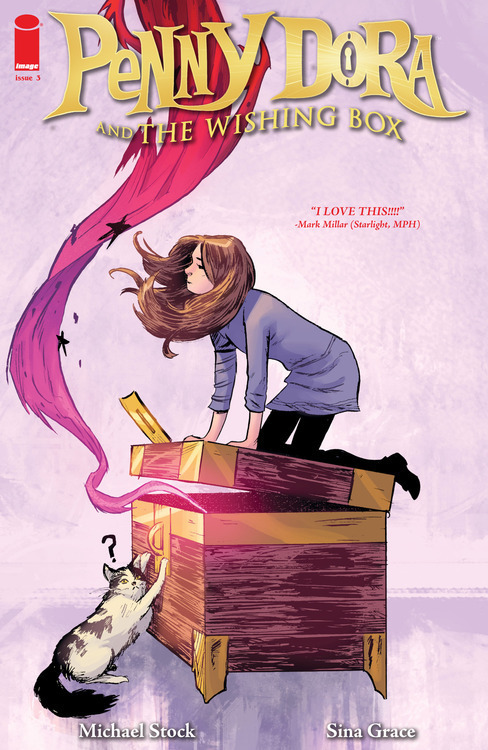 Penny Dora and the Wishing Box #3 (Published by Image Comics; Review by Draven Katayama; ‘Rama Rating: 7 out of 10): Sina Grace and Tamra Bonvillain create an elaborate, inviting world: everything from Penny’s sunny neighborhood to her striped purple sweater is depicted in careful detail. Grace’s art is the best we’ve seen yet: a dream sequence is made even more jarring and whimsical by the use of inventive panel layouts. However, there’s still a nagging sense that Penny is stuck as a victim in her own story, reacting to events out of her control. The focus on supporting character Elizabeth makes the plot feel less protagonist-driven. Michael Stock highlights the mixture of trust and rivalry that children feel toward their best friends. Penny Dora has only just begun to unpack its eponymous lead’s personality, but Stock succeeds in continuing an enjoyable, unpredictable story.